In this special edition of 5 in 10 with Women Who Lead, LEAD intern Mary Motch interviews professional softball player Monica Abbott about what inspires her, how she achieves confidence, and how she overcomes challenges in her career. We even threw in a few bonus questions, since five just wasn't enough! Monica Abbott is one of the greatest softball pitchers of all time. She has played for the University of Tennessee, the US National Team, and the US Olympic Team where, in 2008, she won a silver medal. Monica has also played professionally with the Scrapyard Dawgs, and in 2016 she became the first professional female athlete to ever sign a $1 million dollar team contract. Monica leads the NCAA in all-time career wins, strikeouts, shutouts, innings pitched, games started, and games pitched and holds the record for the most strikeouts in a single season. In 2007, she was named the Women’s Sports Foundation Sportswoman of the Year and an ESPY finalist for Best Collegiate Athlete. Monica is a huge advocate for women in sports and travels all over the world to help empower the next generation of women leaders. 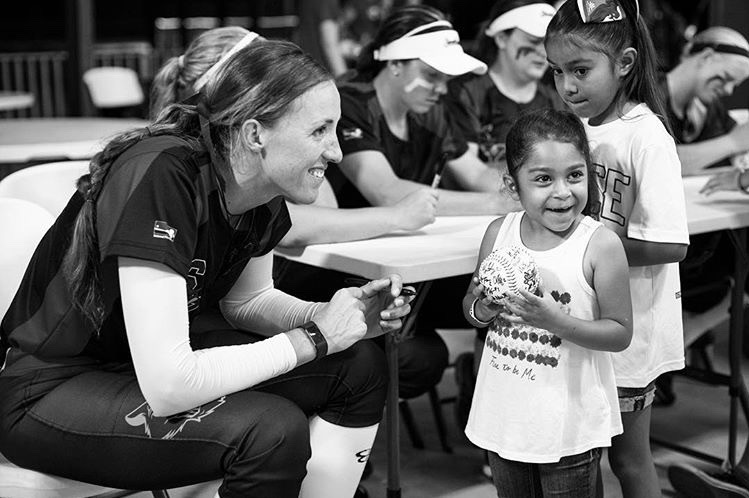 Check out her Instagram @monicaabbott to see some of the amazing young women that she has been working with. Monica is truly an inspiration as she continues to pave the way for women everywhere. We thank her for taking the time out of her busy schedule to sit down with the Lead team! 1) What did you aspire to be when you were younger? I never had a dream of being a firefighter or anything. My dream of wanting to be a softball player was gradual. In 5th grade, we did a school report on states, and I got stuck with the state of Georgia and I was really bummed. I wanted to do like California or Hawaii, or Nevada since I had been there. I was devastated, but in a roundabout way it ended up shaping my life. It was 1996, and the Olympics were in Atlanta. So I had the opportunity to write to people in Georgia and they sent us stuff back. That's when I learned softball was in the Olympics and it began to inspire my dream of wanting to be an Olympic Softball player. 2) What was the most powerful advice you received during your career? That everything will be worth it, though all the highs and the lows - the journey will be so worth everything you experience. 3) What would you tell your younger self about your life now? That it will be better than you will ever anticipate it to be. 4) What other sports did you play when you were younger? Did anyone in your life inspire your love for softball? I played everything when I was younger. I played basketball, volleyball… and anything else that you can imagine. No one specifically inspired me to play softball. 5) What is your favorite thing about softball? I have always loved the amazing bond that I have been able to have with my teammates. They inspire me each and every day and I am so grateful for them. 6) What brings out your confidence when you’re feeling low? I always like to stand a little bit taller. I put my shoulders back, lift my chin up, and don’t look down at my feet. This always helps to give me a great confidence boost. It doesn't help that I am 6'3, but standing tall just gives me that much more confidence. 7) How have you dealt with stressful game-day situations in the past and how did you manage the pressure? I stay in my routine and rely on my teammates, friends, and family. I remind myself that this isn't anything that I haven't experienced before and remember to stay calm and level-headed. 8) How have you dealt with adversity in your career and what did you tell yourself to combat that? I really just rely on the support system that I have and I just have to remind myself that I will get through this. Whether or not the adversity is coming from softball, or an injury, or something else… I always gain support from the people that mean the most to me. 3) What is your pregame ritual, is there a song you always listen to? I don't like to listen to music before I play. I remain calm and I always get in the zone when I put my spikes on.